Review comparison of the DJI Osmo Mobile and Osmo Mobile 2 mobile phone gimbals. This is a 100% honest, 100% authentic review comparison of the DJI Osmo Mobile vs the new Osmo Mobile 2 mobile phone gimbals. Dadtography was not compensated in any way for this post. All images are unedited Dadtography originals. Please don't use our photos without permission. We'll be adding videos shot with each gimbal as they become available, so be sure to check back for those, too! 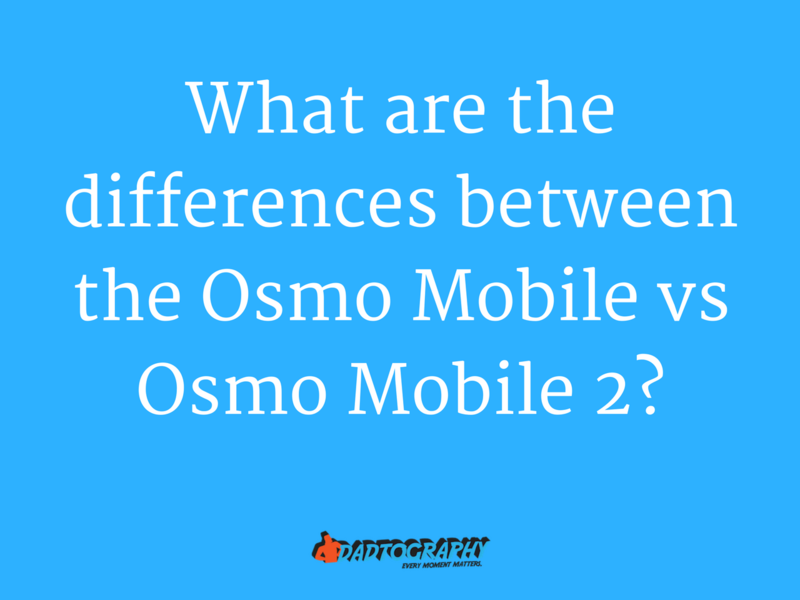 What are the similarities between the Osmo Mobile and Osmo Mobile 2? I ordered (bought and paid for by me) an original Osmo Mobile a few months ago and used it for around a month. I saw the Osmo Mobile 2 was about to come out, so I ordered the updated version as well. I used the Osmo Mobile 2 to shoot photos and videos on a recent Carnival Sunshine family cruise and was really impressed with the results (the videos are still being edited). I thought it would be helpful for people to know the differences between the original Osmo Mobile and the newer Osmo Mobile 2, so let's get started! Edit your own photos in minutes, not hours. The vast majority of the photos you see on website are originals taken by Dadtography photographers. We strive to use our own photos over stock, because that's a key element to telling our story. Many of the photos you'll see are edited using Skylum's Aurora HDR 2018 (af) or Luminar 2018 (af) photo editing software products. Be sure to use code DADTOGRAPHY for $10 off! Luminar & Aurora are powerful, full-featured photo editors. It's easy to learn Luminar & Aurora because of their intuitive user interface. Luminar & Aurora's affordable prices make them a great value. The image quality produced by Luminar and Aurora photo editors is top-notch. How does the build quality and "feel" of the Osmo Mobile vs Osmo 2 compare? I know this is the part of the review that's hard to quantify or show in photos, but the two gimbals feel different to me. The original is a bit heavier than the newer version. To me, this gives it a feeling of being higher quality, although, in my testing, I didn't notice any major differences in durability between the two gimbals. According to the official DJI product page, "The Osmo Mobile 2 is made of a high-strength composite material cuts the weight to just 485g". Both devices feel well-made to me, but further long-term testing would be required to determine which is better built. What is the difference in price between the two Osmo Mobile gimbals? That's one of the first reasons you're here, right? You want to know the differences between the original and the newer version of the Osmo Mobile gimbals, starting with price. Well, the first difference is price. The original Osmo Mobile clocked in at around $200 USD. The newest Osmo Mobile 2 is priced at $129 USD, a much more affordable cost! Let's explore some of the other key differences we noticed in the two device versions. Can both gimbals do portrait and landscape orientation? In short, no. The original Osmo Mobile can only do landscape. The DJI Osmo Mobile 2 phone attachment dial tights and loosens so that the phone can be rotated to portrait. On the original Osmo Mobile, the dial actually is used to secure the phone to the gimbal. This difference in function allows the Osmo Mobile 2 to change to portrait orientation - a very important difference between the two versions of the gimbal. What are the differences in the battery and charging options? To sum it up, the Osmo Mobile 2 uses a standard USB charging port and has a non-removable, longer-lasting battery. Each of these is both an advantage and disadvantage for some. The USB charging port on the DJI Osmo Mobile 2 now standardizes your ability to charge your device. This is a very important difference because the charging cable on the original Osmo Mobile was a din-style charging plug, similar to an audio cable. Most people already have compatible USB charging cables laying around, so the risk of losing your charging cable and having to replace it is far reduced with the Osmo Mobile 2. The non-removable battery in the Osmo Mobile 2 lasts longer (a lot longer, in our testing), but you can no longer swap a dead battery for a fresh spare. In our testing, we used a single charge with the newer Osmo 2 for three full days, taking both photos and videos. The battery life is much improved in the newer Osmo Mobile 2 compared to the original. This is great if you're traveling with the gimbal. Mine survived an entire day of exploring each and every time without any issue. Have you ever wanted to travel the country, or the world and blog about your experiences? Most of us travel, and almost everyone has a great camera right on their smartphone. If all you're lacking is a blog, we can help! Dadtography.com is always looking for new contributors. If you travel and take photos of your journeys, drop us a line! We'd love to give you and your experiences a voice, without all the hassles of running your own website. Thank you for your interest in being a contributor! We’ll be in touch soon. What about differences in the ease of use between the original Osmo Mobile and the Osmo 2? Below are a few of the most noticeable differences we saw that make using one version easier or more challenging over the other. Note: the mobile phone and mobile phone app used with both Osmo Mobile and Mobile 2 was the Google Pixel 2 XL. DJI Osmo Mobile has a front trigger, Osmo Mobile 2 does not - we liked this feature on the original to center the camera to face forward. They removed the trigger on the newest version, but you can still center your Osmo 2 by double-tapping the mode button. Osmo Mobile 2 doesn't offer a wrist strap - we liked this feature, especially if you're traveling with your gimbal. The Osmo Mobile 2 doesn't have a wrist strap option. DJI Osmo Mobile has a compatible base - Osmo Mobile 2 doesn't yet have one available. The base makes it a lot easier to take hyperlapse and timelapse videos. Not having a compatible base isn't the end of the world, but we've found a mini tripod isn't always as stable. It should be noted that the Osmo Mobile 2 is not compatible with the original Osmo Mobile base. DJI Osmo Mobile has a mobile phone sensor, the Osmo Mobile 2 does not appear to have this sensor. We're unsure if this causes a functional difference. It didn't appear to in our testing. What do you think - Are you using an Osmo Mobile gimbal for your phone? Which do you prefer - the original or Osmo Mobile 2?